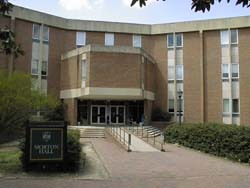 Morton Hall is located at the intersection of Jamestown Road and Ukrop Drive. The Classical Studies Department's main office is located on the third floor, room 324. From College Corner (the V intersection of Jamestown and Richmond Roads), proceed west past Phi Beta Kappa Circle and turn right into the next parking area. Morton Hall lies directly ahead. Visitors are encouraged to obtain a Visitor Parking Pass, available for a fee from Parking Services at 201 Ukrop Way. With a Visitor Parking Pass, you can park in any campus space designated for visitors, faculty/staff, or students (unless restricted "at all times"); and, if appropriate, at any space reserved for the disabled. Metered spaces, very few in number, are also available to visitors. Campus parking is regulated and closely enforced from Monday at 7:30am through Friday at 5:00pm. Other times, unless the spaces are subject to specific restrictions, campus parking is open to the public. In many areas adjacent to the College, street parking is subject to certain restrictions. Read the signs carefully to avoid being ticketed. Three airports are convenient to Williamsburg: Richmond International Airport (RIC), Norfolk International Airport (ORF), and Newport News/Williamsburg Airport (PHF). Richmond and Norfolk are each about an hour from the College by car; Newport News is about 40 minutes. Keep in mind that there is a tunnel between Norfolk and Williamsburg, which can sometimes cause traffic delays. All airports offer shuttle service to Williamsburg and the College. Amtrak offers train service to Williamsburg and can be a convenient way to travel from the northeast corridor. The station is about a fifteen-minute walk from College Corner.